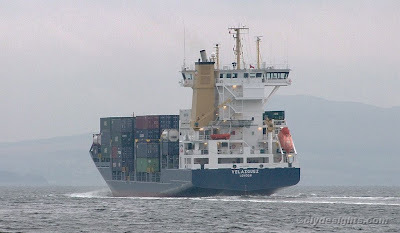 Both vessels employed on MacAndrews services from the Clyde to the Iberian peninsula called at Greenock today, with VELAZQUEZ being the first to arrive this morning. Still serving on the Greenock-Rotterdam-Leixoes-Lisbon-Dublin-Liverpool route, VELAZQUEZ sailed this evening for the Dutch port. She was joined later today at Ocean Terminal by CANOPUS J., which sails on the other MacAndrews service from Northwest Europe to Spain.